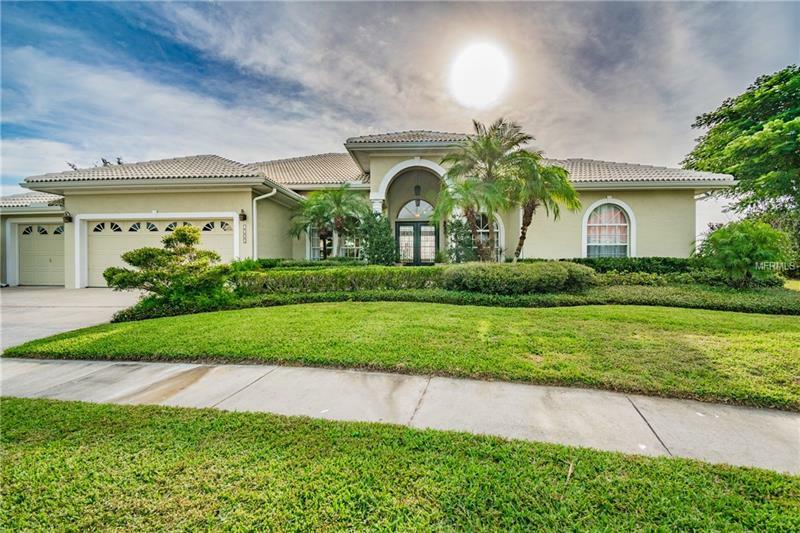 Gorgeous, RENOVATED home on a beautiful CONSERVATION lot in the GATED community of Bayside. If you love nature, privacy and tranquility, then you have found the right place! Stunning backdrop & paths to the water to go kayaking from your own backyard! (no dock can be built) Owners just built a HUGE deck off the back of the house which cost them $15k to complete!The moment you drive up to this beautiful home, you will love the curb appeal & it is right in the middle of a CUL DE SAC, so you are set back from neighbors with a nice pie shape lot. Enter the home through beautiful CUSTOM DOORS & as you stand in the foyer, the wow factor hits you!Great OPEN FLOOR PLAN, HIGH CEILINGS, CROWN MOLDING, POCKETING SLIDER DOORS bringing the outside in, & did i mention the beautiful view? WOOD FLOORING throughout with nicely upgraded tile in the foyer, baths & kitchen. The living/dining area is spacious & made for entertaining, flowing in & out of pool area! The kitchen is amazing with QUARTZ countertops, STONE BACK SPLASH, WINE RACK, under cabinet lighting, copper FARM SINK, double CONVECTION ovens, breakfast nook, & overlooks the family room, so you can be in on the fun! The family room is HUGE & has a FIREPLACE, POCKETING SLIDERS TO POOL, & windows galore! The spacious master suite has a lovely sitting area for quiet time, & a beautifully renovated master bath has 2 separate vanities, garden tub & walk in shower. 2 bedrooms off the family room with a Jack-Jill bath, & another bedroom with pool bath round out the home.